Book your place and enjoy Mediterranean New Year. 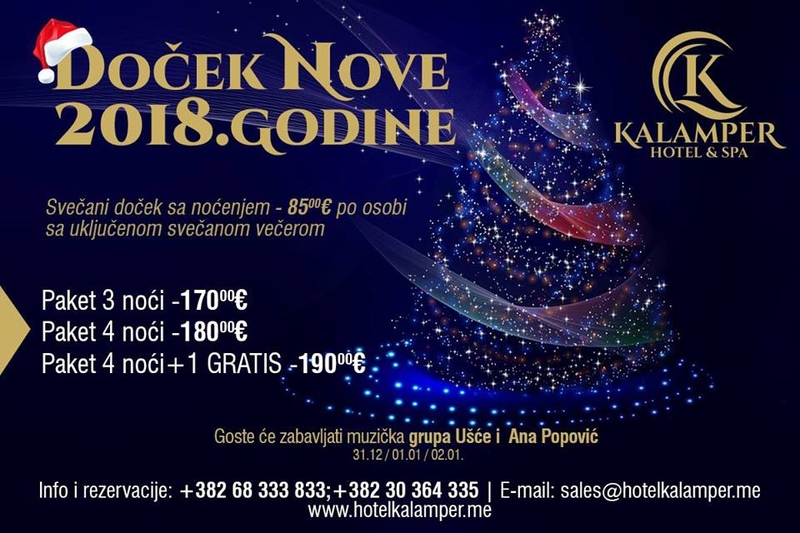 Contacts: reservations@hotelkalamper.me or by phone +382 68 333 833. Celebrate New Year in the beautiful ambience of the newly opened Kalamper Hotel & SPA. Guests will be entertained by the music group Ušće on 31.12., 01.01. and 02.01. - 2 nights package (31.12.-02.01.) 140.00 € per person with gourmet dinner included on 31.12. and 01.01. - 3 nights package (31.12.-03.01.) 170.00 € per person with gourmet dinner included on 31.12., 01.01. and 02.01. - 4 nights package (31.12.-04.01.) 180.00 € per person with gourmet dinner included on 31.12., 01.01. and 02.01. - 4 nights + 1 FREE package (31.12.-05.01.) 190.00 € per person with gourmet dinner included on 31.12., 01.01. and 02.01. Prices are per person, based on bed and breakfast in standard double rooms overlooking the sea. Package price includes gala dinners on 31.12., 01.01. and 02.01. Residence tax and insurance are not included in the price, which is 1.50 € per person per day. - For one child aged 7 to 12 years - 50% discount on accommodation and meals. - For another child up to 7 years - GRATIS.